It's been so long since I last posted, I thought I might have forgotten how to! But I haven't so that's all good. I haven't been doing mush sewing but my hook has been busy. I've finished the throw for my bedroom chair as my old Ted really approves. He's told me it's very warm when the nights are a little chilly. I love my Ted he's always been with me through thick and thin. I can't ever remember not having him and I'd be distraught if anything ever happened to him. He's only got one eye and he had to have new felt paws last year. But he's not doing too bad for 47. I think a woman's best friend is her Ted! I used three colours from the WI range of yarn at Hobbycraft it's lovely to work with and one of my favourite yarns at the minute. It was my first attempt at V stitch and I love it, it crochets up so quickly. 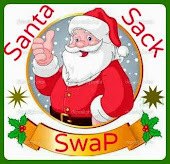 I've joined a couple of Swaps this week too. 2015 Dishcloth/Mug Rug Swap over at Creative Chaos hosted by the lovely Kimberley. Why not pop over and have a look. Maybe join in too. Ted looks adorable sitting on the beautiful crochet throw and wicker chair. Hi Melanie - I've paired you with Maria in Wales for the dishcloth/ mug rug swap. Please e-mail me at Kimberley@atkinson.org.nz for her details. (she does not have a blog). Thanks for mentioning swap above. Found your blog and so glad I did, such lovely stuff here.. love the hexies.. well done you on the bag swap, loved yours and the one received. I shall have a look at some of the swaps.